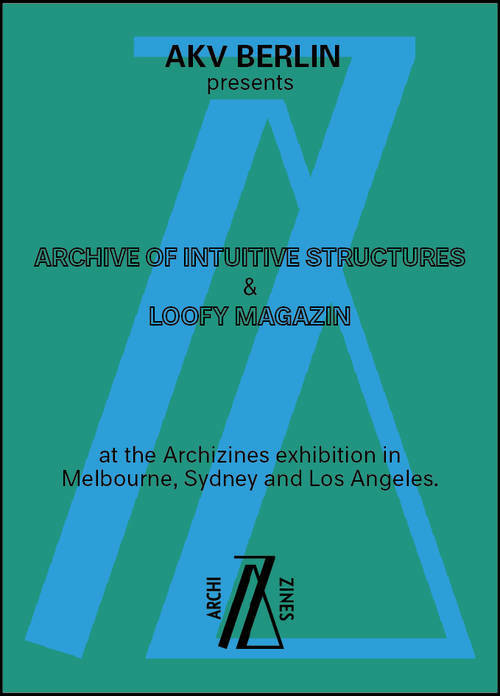 The Archive of Intuitive Structures >> and Loofy Magazin >> invited to the Archizines exhibition in Melbourne, Sydney and Los Angeles! The exhibition opens on 1 February at the brand new Design Hub in Melbourne. The exhibition will then be presented by the University of Technology, Sydney at Object: Australian Centre for Design, and the Perloff Gallery, UCLA Architecture and Urban Design in Los Angeles. The exhibition features titles from the collection alongside video interviews with their creators. Each publication has selected one issue to represent their approach to publishing and they are all available for visitors to read. The Melbourne version of ARCHIZINES will be the biggest yet, including new and more recent publication additions such as POST from Melbourne, FAKE CITIES / TRUE STORIES from Bratislava, Proposals from Helsinki, and the Archive of Intuitive Structures from Berlin. The original ARCHIZINES collection will be transferred to the National Art Library at the Victoria & Albert Museum, London. Print-ready images, interviews and the full list of publications available on request.